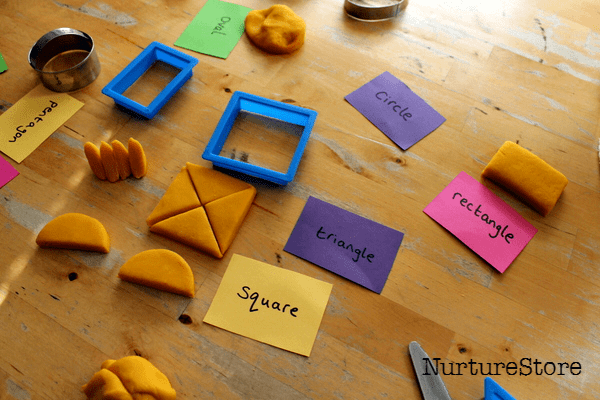 Here are some ideas for hands-on math play: an exploring shapes activity using play dough. Play dough is one of our favourite Super Toys. It’s quick and easy to make homemade play dough, it’s fun and hands-on, and lends itself to all sorts of play. Today we’re using it to explore shapes. I made a quick set of shape cards – just pieces of colourful cards with the shape names written on – and set them out with a mound of play dough and some shape cookie cutters (which you can find on these affiliate links at Amazon.co.uk and Amazon.com – NurtureStore gets commission for purchases via this links). And then we started exploring. You could set this activity out as a self-serve discovery table, or sit with your child/ren and play along together. Both offer great opportunities for exploration and learning. Today I joined in with the play and we had all sorts of chat going on about the shapes. To begin with you can just play. 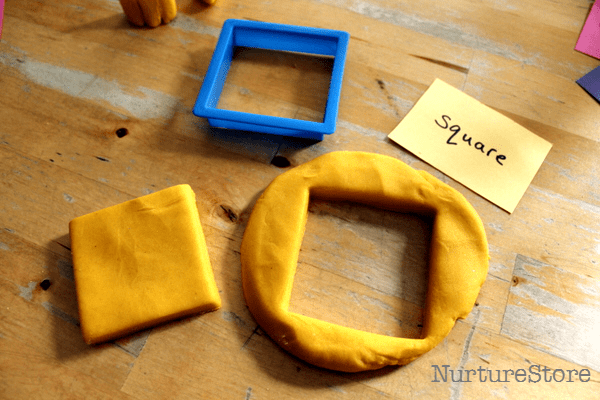 Use the cookie cutters and have fun exploring with the play dough. Lots of math and language learning happens simply through playing with materials like these, which gently introduce concepts of shape, size, and numbers, just by being different shapes, sizes and numbers. And then there are also more structured games you might play. :: See if you can match up the cookie cutter shape to its matching word. Stamp out that shape in the play dough and notice how the negative space left behind also makes a shape. 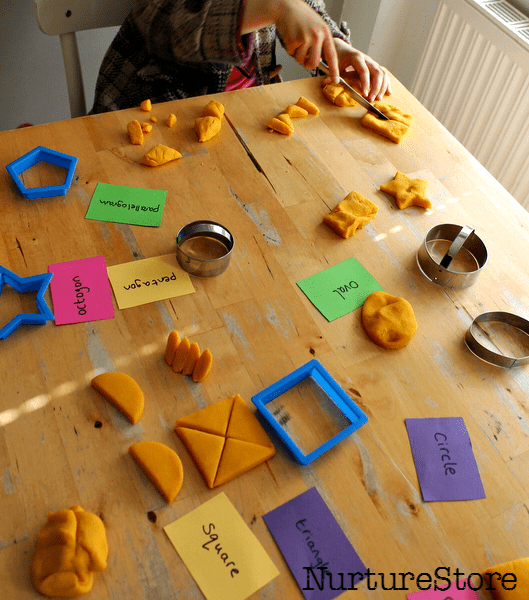 The cookie cutters are great for printing in the play dough, so you can make a shape matching puzzle. :: How many sides does your shape have? :: Can you spot any right angles? :: How many different ways can you make a triangle? Add in some blunt-ended knives and you can cut up the shapes and see what else you can make. :: Do all the shapes make fair shares when they are cut up? :: Can you spot any shapes inside shapes (like the triangles and square above)? 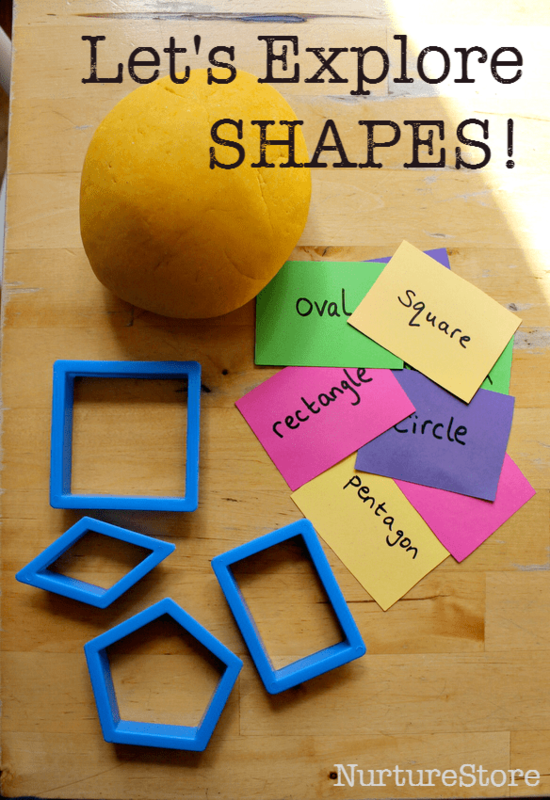 :: What shapes can you make if you join some of your play dough pieces together? :: Can you make any repeating patterns with your play dough pieces? :: What about making some bigger 3-D shapes? You don’t need to try all these ideas in one session. Go at your child’s pace, notice what they are interested in and use that as your lead for today’s activity. 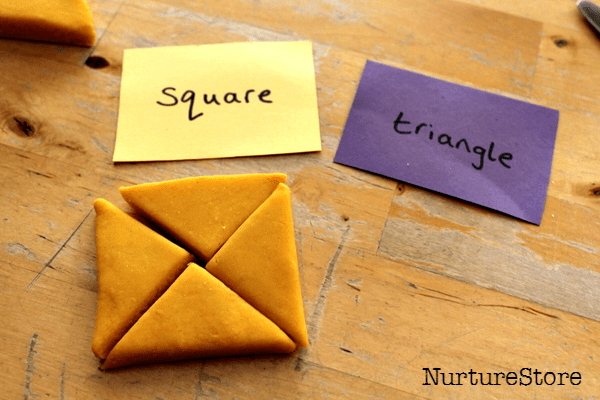 There is much benefit from revisiting this activity several times and seeing what new ideas pop up, and noticing how your child is using new vocabulary or knowledge in their play. Children learn best when they are having fun and exploring hands-on activities, and there are many ways you can add creative play to successful math and science learning. 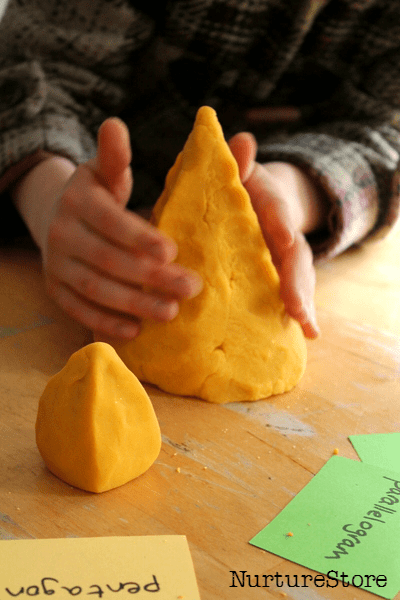 If you would like more ideas for how you can use the medium of play dough to explore math, literacy, art and play, The Homemade Play Dough Recipe Book has a whole year’s worth of ideas for you. And if you’d like to focus in on playful math activities, you and your children will find a bunch of brilliant ideas in my guide to ABCs and 123s. 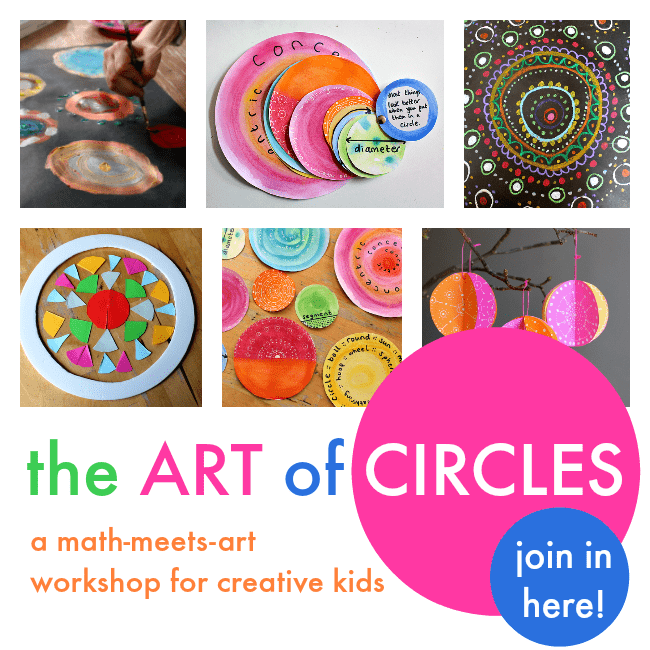 And to work across the curriculum and combine math and art, join in with my ART of CIRCLES workshop.